Who’s your Caddy? 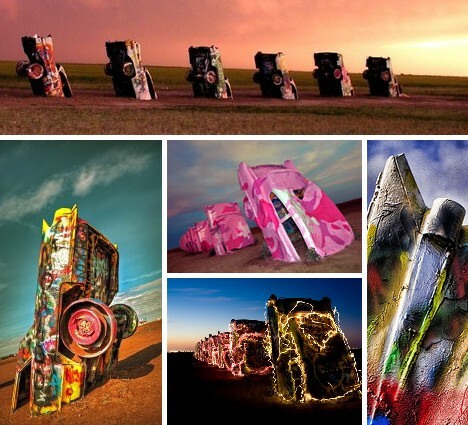 The 10 graffiti-encrusted art car Cadillacs that make up Cadillac Ranch, just outside of Amarillo, Texas, have left their highway cruising days far behind. 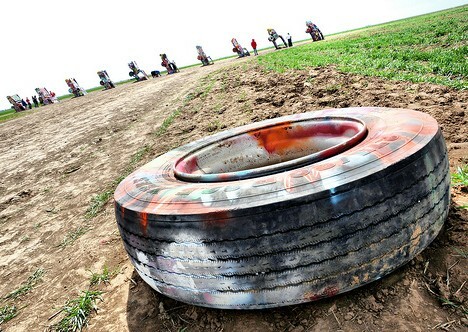 In fact, their behinds are all that’s visible now that they’ve been angled, grill-first, into the fertile soil of the Texas panhandle. 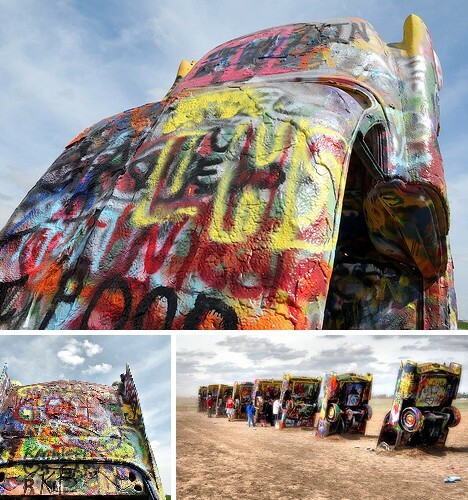 Driving down Interstate 40 just outside of Amarillo, Texas, windows rolled up against the dust of the wide, flat Texas Panhandle, a curious sight breaks the monotony of the dun-colored plains. From a distance one is reminded of the canted smokestacks of the doomed ocean liner Titanic, save for the fact that there are ten funnels instead of four. 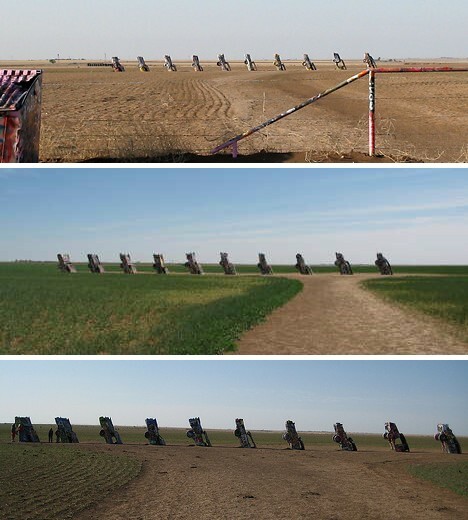 The objects are finally revealed to be a row of cars, Cadillacs at that, each one angled into the rich prairie soil as if an Olympian giant had used them for javelin practice. If you’re like a lot of people, you’ll pull off the highway and park. 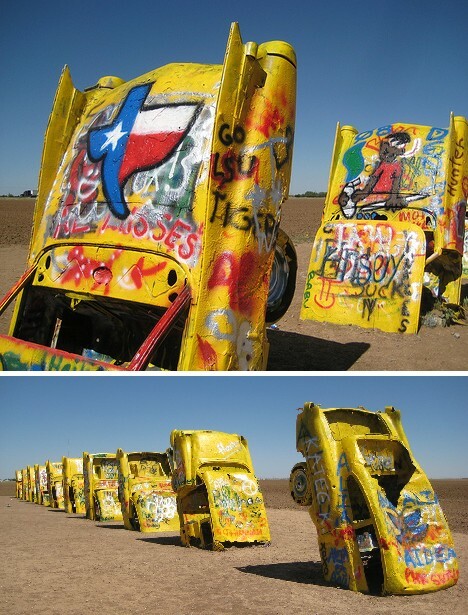 An open gate beckons… Congratulations, you’ve arrived at what may be the world’s most unusual public art exhibit, Cadillac Ranch: ten classic, fin-tastic Caddies “justa gleaming in the sun”, each one defiantly scratching at the bright blue Texas sky with its audacious, outrageous tail fins. If your timing is right, the cars themselves might be carrying a complementary coat of sky blue paint. Every so often the cars are painted over, in effect becoming a blank 10-piece canvas that soon becomes filled once more and the cycle then repeats. 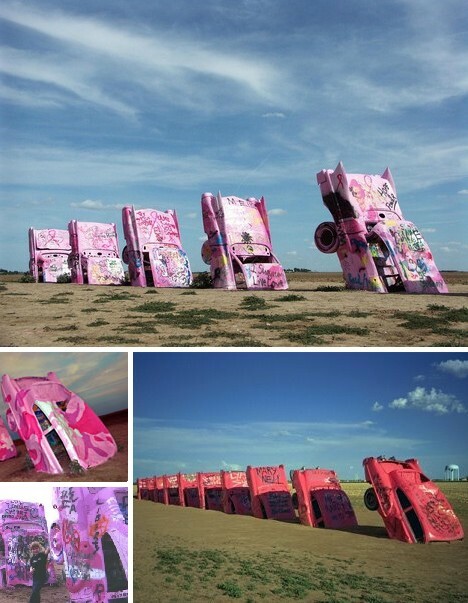 The cars have been painted pink twice – once (in eye-blasting pink camouflage) as part of a 2005 breast cancer awareness campaign called Operation Pink Flamingo and on another occasion to mark the birthday of Wendy, wife of Cadillac Ranch’s owner and patron, Stanley Marsh 3. 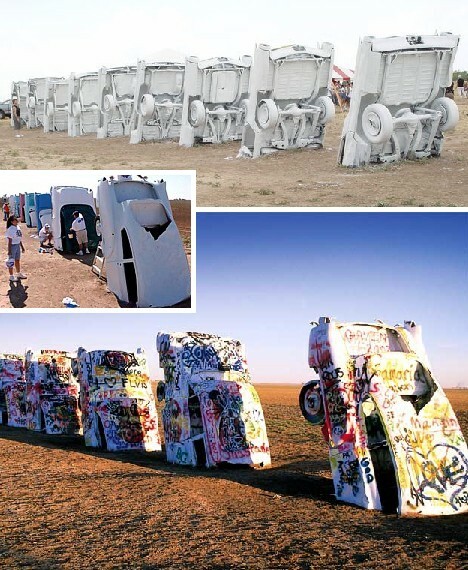 The cars were painted white at one point at the request of an advertiser who wanted to feature a ghostly, whited-out Cadillac Ranch in a TV commercial. One can imagine how quickly and eagerly graffiti artists descended upon the immaculate white cars once the shooting officially ended! In May of 2002, Ant Farm decided to restore the cars to their original colors though the broken windows, stolen chrome trim and even a few pilfered body panels were not repaired nor replaced. 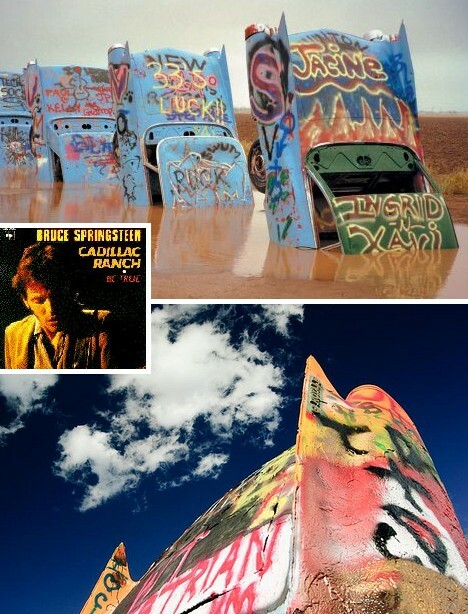 The restoration was in conjunction with a Route 66 related refurbishment project sponsored by Hampton Inns: within 24 hours fresh graffiti began to appear on the cars. On a sad note, all 10 cars were painted matte black in June of 2003 as a homage to the passing away of one of Ant Farm’s founding members, Doug Michels. There is ongoing maintenance at the Ranch, performed by remaining original Ant Farm artists Chip Lord and Hudson Marquez. 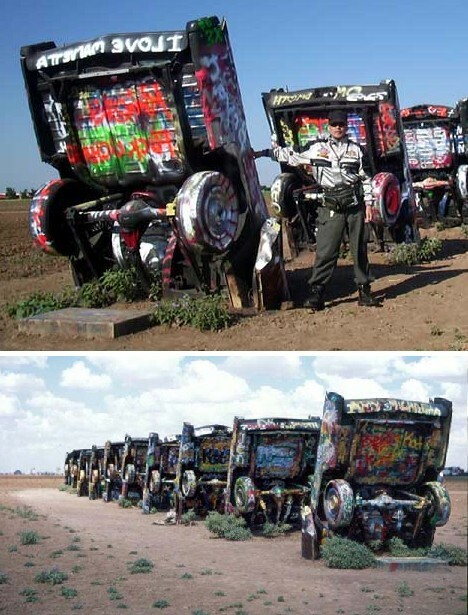 From its inception in 1974 Cadillac Ranch has been very much a work in progress, unlike other roadside attractions like the “World’s Biggest Ball of Twine” or what have you. Public interaction doesn’t affect the message Ant Farm sought to proclaim when they built the Ranch, which is to pay tribute to America’s love affair with the automobile and illustrate the way it symbolizes our contradictory desires for freedom on the one hand; to be rooted in one place on the other. With every red-blooded American in mind, here above are the cars painted in rich hemoglobin red. Ten ultimate rewards of the American Dream are rooted, all right – buried to the waist in several feet of rich Texas topsoil. Yet all is not as it seems. There’s a method to what some have called madness, and a close look at the actual sculpture reveals order emerging from chaos. For one thing, the model years of the individual cars run in sequence as follows: 1949, 1950, 1954, 1956, 1957, 1958, 1959, 1960, 1962 and finally 1963. When painted up in a monotone hue like New York City Taxi yellow, the differences in fin styling are more readily visible (plus the graffiti contrasts extra-nicely!). The model years of the participating automobiles were specifically selected to show the rise and fall of the trademark Caddy tail fin, skipping years in which little or no changes were made. It should also be noted that not only are the cars positioned in a straight line, each one is tilted at a common angle matching that of the Great Pyramid of Giza… sounds like somebody’s in de Nile. 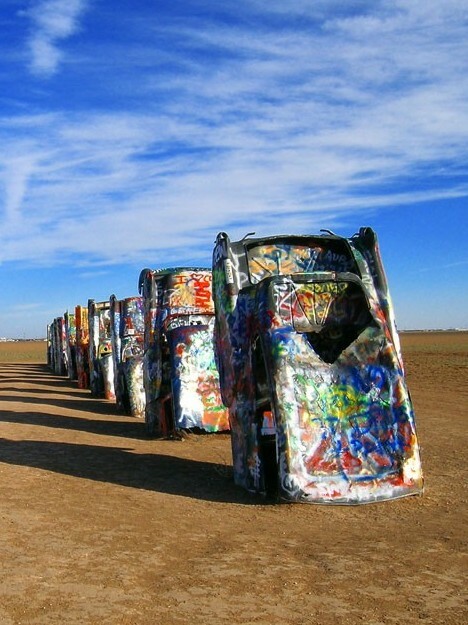 Like other artists before them, Ant Farm needed the support of a patron who would help bring the concept and inspiration behind Cadillac Ranch to fruition. Enter Stanley Marsh 3, a Texas millionaire who, like many others in the state, made his fortune in the oil bidness. The “3” isn’t a typo: Marsh believes adding the Roman numeral III to his name would be somewhat pretentious. Evidently Marsh liked what he heard. 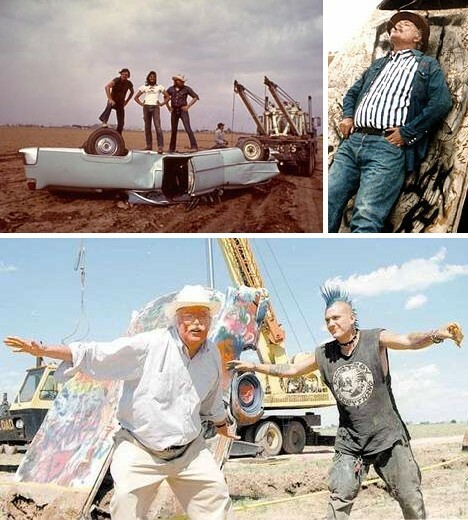 Throughout the spring of 1974, the members of Ant Farm prowled the used car lots of Amarillo and environs, buying up a small fleet of tired old Caddies and driving them back to a wheat field just off historic Route 66. 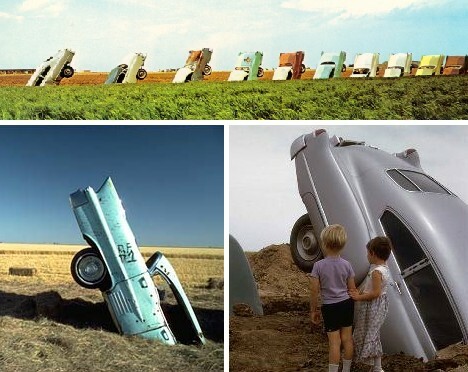 One by one, the cars were literally driven into the ground, their resting angle aligned and adjusted. Finally the earth was packed down solid, suspending each vehicle between earth and sky. After the final car (a tough to find, salmon pink, 1957 Sedan de Ville) was planted on June 21, 1974, Marsh held an outdoor party at the site complete with a catered bar and highlighted by the champagne-bottle christening of the first car in line, a silver 1949 Club Coupe. 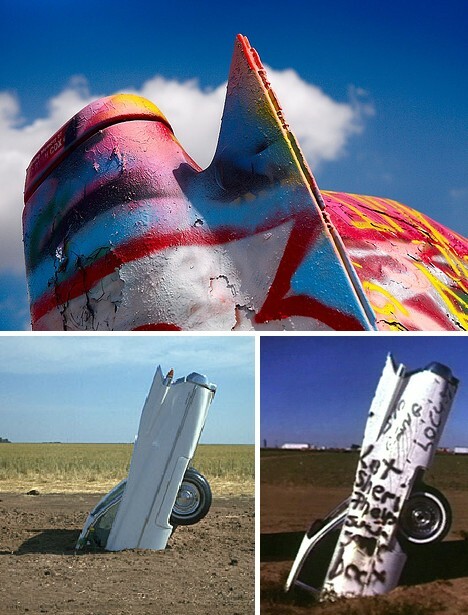 It was a rare occasion for autos and alcohol to mix but hey – there’s only one Cadillac Ranch. 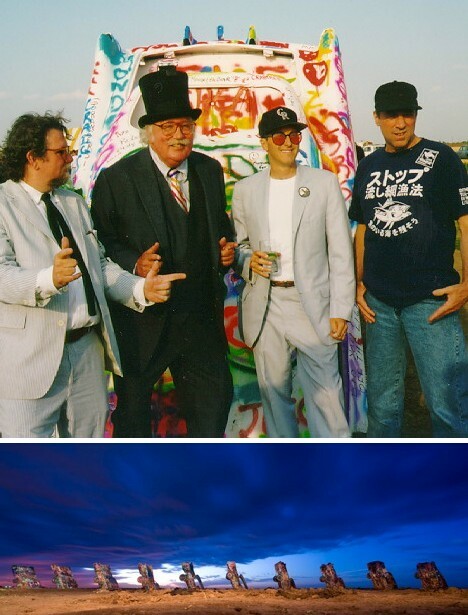 Patron, artists and 200 guests converged on Cadillac Ranch on June 21, 1994 for the 20th anniversary of the opening and posed for the photo above. 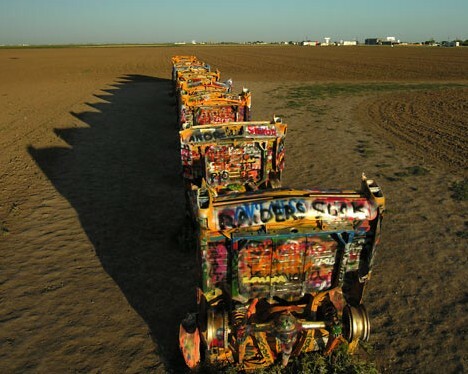 35 years after its creation, Cadillac Ranch has established itself as an icon of American pop culture. 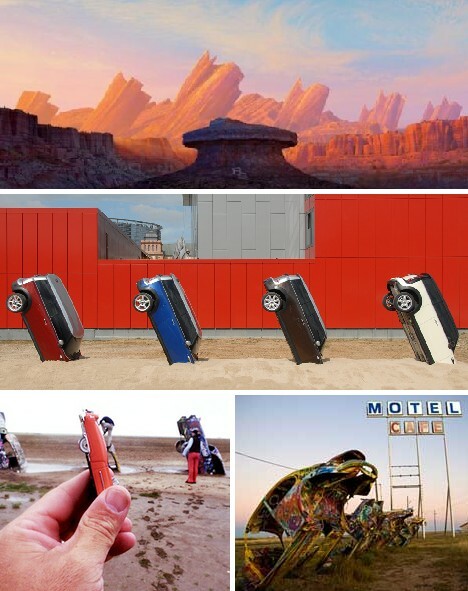 Most of those who’ve seen the Pixar animated film Cars didn’t need any explanation when the “Cadillac Range” appeared on screen, and Ant Farm’s art car extravaganza has garnered a host of tributes, homages and out & out imitations in advertising media and the real world. 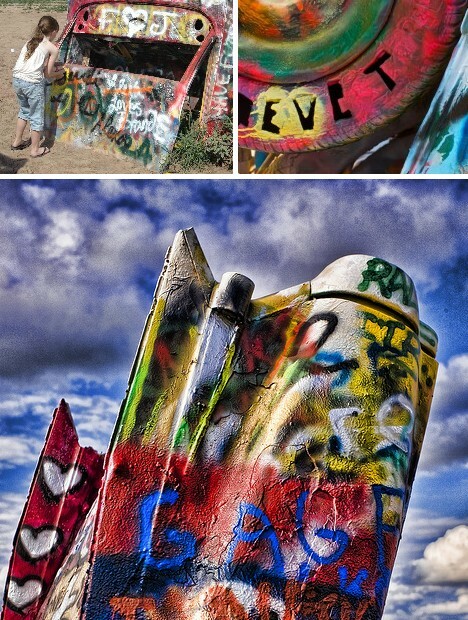 Cadillac Ranch has proven to be both an inspiration and a challenge to photographers of all types, due to the often harsh lighting and the number of visitors who visit this always open, open-air public artwork. Even so, this challenge has been taken up and to our great delight, met with outstanding success. The above images come to you courtesy of David Kozlowski, a freelance photographer based in Dallas-Fort Worth, Texas. Kozlowski knows his neighborhood and his neighbors, treating them with immense respect as he treats us to a very special auto show. 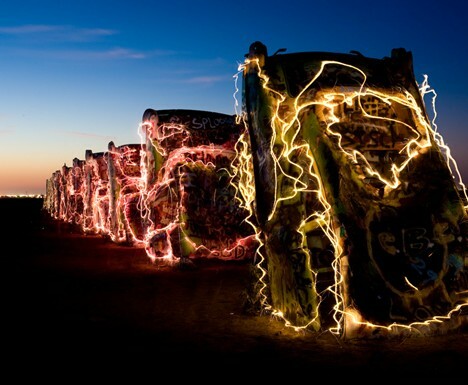 On a moonlit night with the prairie wind a-blowing and with no one for company but the tumbling tumbleweeds and the cries of the coyotes, Cadillac Ranch takes on an eerie, almost otherworldly atmosphere. Sound inspiring? Ask Bruce (The Boss) Springsteen. 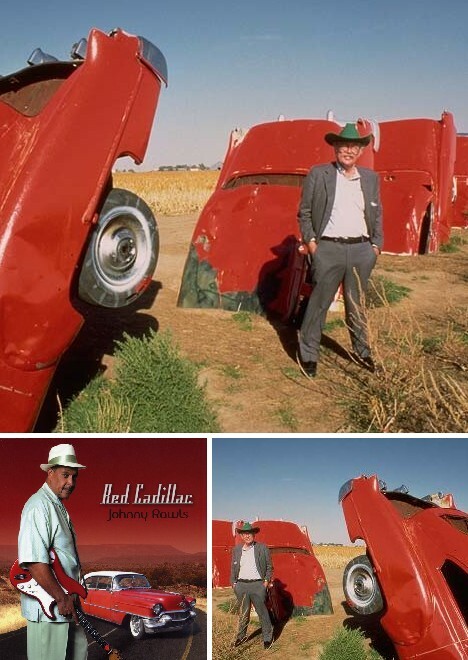 He paid a visit in 1979 between tour stops, then recorded “Cadillac Ranch” for his 1980 album The River. 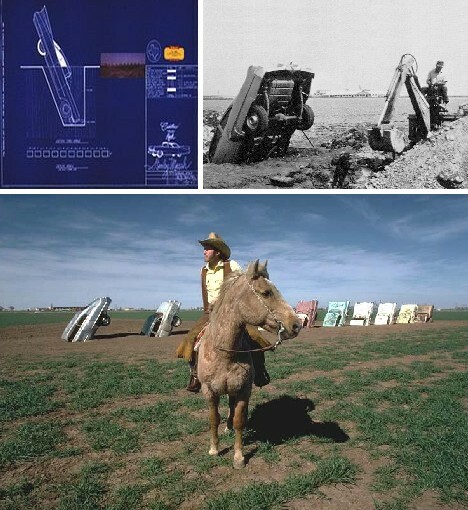 Mosey on out to the Ranch sometime… you might get inspired too!